Cut one 12-inch sheet of foil and spread it flat on the counter. Place the garlic heads, cut-side up, in the center of the foil. Drizzle ½ teaspoon olive oil over each head and fold up the sides of the foil to seal well. until the garlic is very tender, about 40 minutes. Remove the foil packet from the oven, open the foil and set it aside to cool. 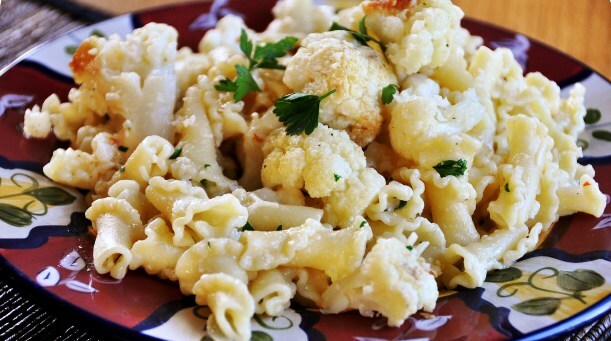 Place the cauliflower in a large bowl; toss with 2 tablespoons oil, salt, pepper, and sugar. Carefully transfer the cauliflower to the baking sheet and spread into an even layer. While the cauliflower roasts, bring 4 quarts of water to a boil in a large pot. Add 1 tablespoon salt and pasta; cook until al dente. Squeeze the cooled, roasted garlic cloves from their skins into a small bowl. Slowly whisk in remaining 1/4 cup oil. Drain the pasta, reserving 1 cup cooking water, and return the pasta to the pot. and additional lemon juice to taste. Serve immediately, hot, sprinkling with remaining ½ cup cheese and toasted nuts.